Photo L-R. Ambassador Lhuillier discussing the Philippines’ 10-point economic agenda during the ASEAN Business Forum. Ambassador Lhuillier with the Ambassadors of Indonesia, Thailand and Malaysia and CEOE Vice Chairman Jose Vicente Gonzalez (middle). 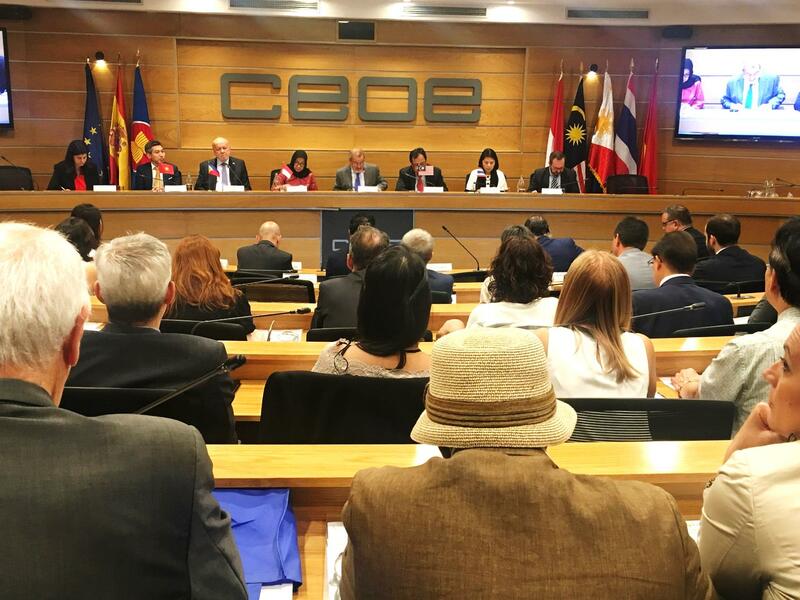 Ambassador Philippe J. Lhuillier headed the Philippine delegation to the ASEAN Business Forum which was held last 28 June 2017 at the CEOE Headquarters in Madrid. Entitled “Trade and Investment Opportunities in ASEAN”, the forum was jointly organized by the ASEAN member countries present in Madrid and the Confederacion Española de Organizaciones Empresariales, on the occasion of the 50th Anniversary of the establishment of ASEAN and the 40th Anniversary of ASEAN-EU Relations. Ms. Maria Aparici, Deputy Director General for Trade Policy of the Spanish Ministry of Commerce, and CEOE Vice Chairman Mr. Jose Vicente Gonzalez, both emphasized the importance of ASEAN for the Spanish business community because of ASEAN´s population, strategic location and economic development. They advised Spanish companies to further explore the vast trade and investment opportunities in ASEAN countries. Ambassador Lhuillier, on the other hand, highlighted the Philippines´ potentials as a trading partner, business hub and investment center. The Ambassador discussed President Duterte´s 10-point socio-economic agenda, focusing on the “Build. Build. Build” program of the Administration. He informed the Spanish businessmen present of the high-impact projects that will further boost the economic growth of the Philippines, such as the building of roads, mass transport systems and infrastructure projects, among others. The Ambassadors of Malaysia, Thailand, Indonesia and the Minister-Counselor of Vietnam also made their separate presentations, which were followed by the sharing of business experiences of Spanish companies in ASEAN countries. After a short cocktail-reception of ASEAN delicacies which were offered by the participating countries, private business meetings with interested companies were separately held at the CEOE meeting rooms. The Ambassador, assisted by Minister and Consul General Emmanuel R. Fernandez, met with at least five Spanish companies which expressed their interest to do business in the Philippines. Ambassador Lhuillier and Minister and Consul General Fernandez met with Spanish businessmen during the one-on-one private meeting.